I wish to take this opportunity to welcome you to our school. Colerne CE Primary School provides a happy and caring community, where children feel emotionally secure and their individual needs are genuinely catered for. By providing both an environment and a range of experiences that are stimulating, we hope to excite that natural curiosity that is inside every child and harness it to guide them towards discovery and a love of learning. Through a broad skills-based curriculum and strong relationships we aim to develop self-confidence, high self-esteem and a sense of personal worth and potential. We believe that a child’s self image is of paramount importance. We aim to develop within children lively and enquiring minds which, supported by their confidence, will enable them to tackle new and challenging situations. We strive to equip them with the necessary skills of fluent communication, reading and numeracy combined with a real interest in creative and physical pursuits. Above all we hope to foster within the children a Christian attitude and a genuine care and concern for their environment and the ever increasing breadth of people around them. Expectations at Colerne are high, as are children’s opportunities. If you have not already visited our school please arrange to do so. We are proud of our school and feel sure you will see why; we look forward to working in partnership with you in the future. Please find below important documents and information about our school. If you would like a paper copy of any information on our website please contact the School Office on 01225 742367, which we will be happy to provide free of charge. Parents Evenings – held three times a year to discuss your child’s learning, their social and academic progress and achievement. The first meeting is at the beginning of each new school year in the form of a group meeting during school time. Curricular Evenings – these are “one-off” opportunities for you to take part in fun activities with your child, enhancing your awareness and understanding of the content and approach to learning and the curriculum. These are held once a year and have proved very enjoyable as well as informative. By Invitation – for example, to a class assembly, supporting your child in an inter-school match or tournament, a musical concert, etc. By Individual Appointment – you may contact the class teacher or Headteacher at any time to discuss your child’s progress, development or indeed, any other aspect linked to their schooling. Please inform the school by letter or telephone if your child is absent for any reason. Absences not explained by a letter or telephone call are recorded as unauthorised. If you require your child to leave school during school hours you must inform the School Office and arrange to have your child collected from the classroom. Children are not allowed to leave during school time without adult supervision. It is a legal responsibility that all parents ensure that their children attend school regularly. There may be an occasion when you want to request an absence. 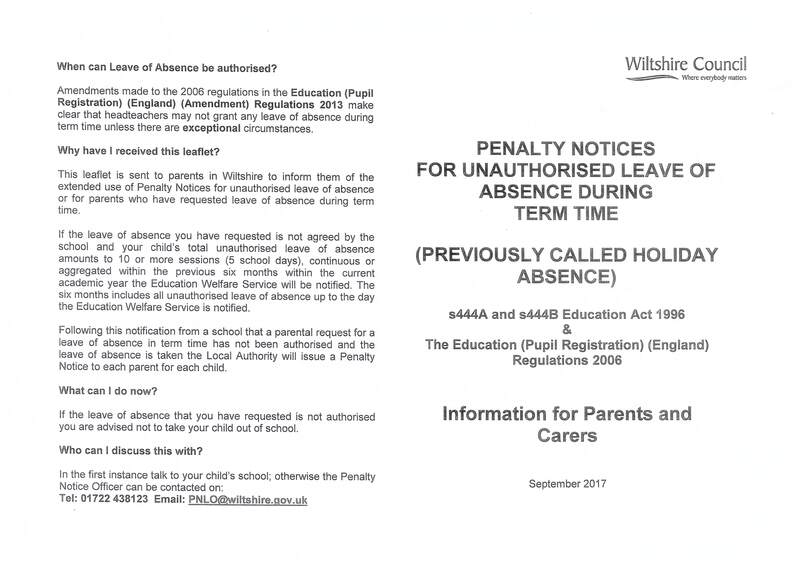 Within the context of the law, it is only the Headteacher that can approve this absence, therefore only the school can decide whether an absence is authorised or unauthorised. This has to be recorded in the attendance register against the child's record of attendance. The school works closely with the Education Welfare Officer to manage unacceptable levels of absence. 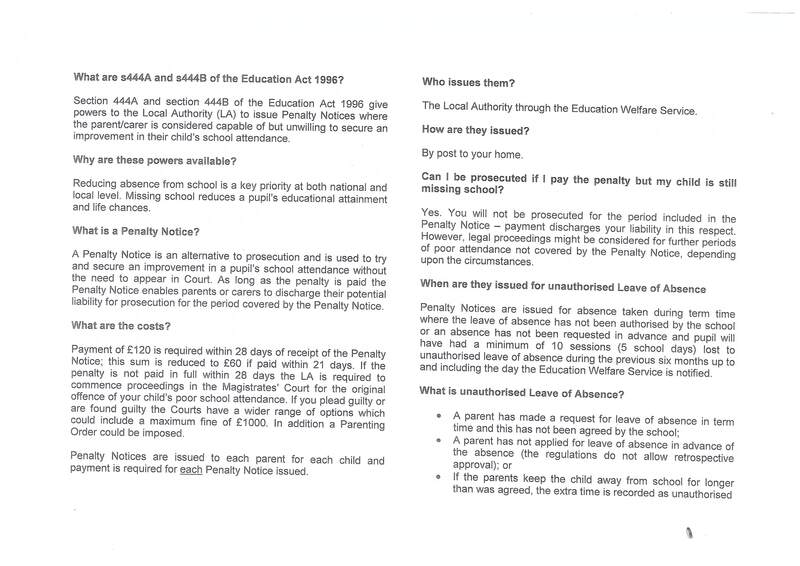 Whilst the school will do everything possible to cooperate with parents, no parent can demand a child's leave of absence for the purpose of a holiday. Each application, which should be submitted on the appropriate form to the Headteacher prior to the leave, will be considered on its own merit. If it is acknowledged that the holiday cannot be reasonably taken at any other time, then leave of absence up to a total of two weeks (i.e. 10 school days) in any one academic year may be authorised by the Headteacher. However such authorisation will be dependent on the child’s overall attendance record and the stage of their education. It must be emphasised that holidays taken in term time are disruptive to a child's education.